Parks’ 6 Tots Gift Sets are ideally suited as gifts for both formal and informal occasions. They consist of six identical premium aromatherapy candles, mixed by hand to create a scent combination that can awaken the atmosphere of any internal space. 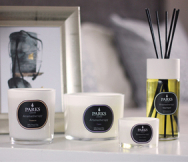 Every Parks ‘tot’ Candle is hand poured into a votive mini vase of sturdy yet elegant glass, with one of our finest smokeless cotton wicks at its core. They last for up to eight hours of continuous use, and provide a steady, soot-free flame as well as a wonderful scent. The Rosemary and Bergamot tot set is designed to aromatherapy standards to provide an invigorating and uplifting experience. The bergamot essential oils are the first thing most customers notice. This is, of course, a citrus fruit, and the scent of Earl Grey tea. From an aromatherapy point of view, it helps to improve low moods and resists depression or sadness. Rosemary is a very delicate, almost spicy scent, but one that comes through clearly when combined with bergamot. It gives the whole a richer, more earthy tone without muting its high points in any way. The combination is a tonic to the soul, and has been described as a pick-me-up similar to a strong cup of tea. Each will retain this powerful scent for years if necessary, from first light until the last drop of wax has melted away. The Parks Rosemary and Bergamot 6 Tots Gift Set ships in a lovely gift box.